Getting Cheap SR22 Insurance In Missouri: Updated 2016 Guide – Select Insurance Group provides affordable SR22 insurance in Missouri at low cost. The following guide is prepared to cover all major aspects of Missouri SR22 law and maintaining your policy. This guide is updated and valid in 2016. Our company shops multiple vendors to meet the needs of our customers. We are licensed across the United States to provide SR22 services. We are not limited to Missouri. All drivers in Missouri have to have valid insurance policy in case they operate a motor vehicle. This insurance policy have to meet state law mandatory minimums in order to legally drive. It is illegal to drive without insurance or have it in suspended status. If caught on driving without insurance – you’ll be considered as a high-risk driver. Generally speaking a high-risk driver is one who is violating traffic laws. Why would DMV require SR22 insurance filing in Missouri? What can Select Insurance Group do for you? 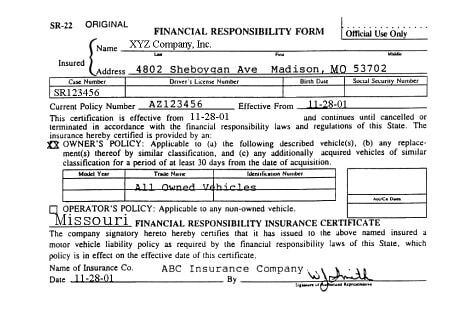 Missouri SR22 insurance is safety responsibility certificate. It is official evidence to Department of Motor Vehicles (DMV) that you have insurance. Usually drivers in MO and other states are required to get SR22 in case they need to reinstate their driver’s license. It is a small form that contains your personal information and vehicle that you operate. Once filled out – it will be submitted electronically by your insurance provider on your behalf. The minimum period of requirement of SR22 insurance in Missouri is two (2) years. In case you fail to maintain it for a whole period of requirement – your insurance provider will instantly inform DMV about your filing status. In this case driver’s license will be suspended again. A person will need to start over from day 1 with SR22 requirement. It is important to know, that SR22 is not insurance – it is the evidence that you have insurance. But it is well known and called as “SR22 insurance”. The DMV may require SR22 insurance filing in Missouri for specific reasons. This happens when a driver violates traffic laws and classified as a high-risk driver. Driving under the influence of alcohol or DUI. That also includes underage drivers. Driving while intoxicated or DWI. Driving without insurance or driving while insurance is suspended/not valid. Multiple traffic law violations. Like having 12 points in less then two years. Vehicular assault that caused injuries or death. 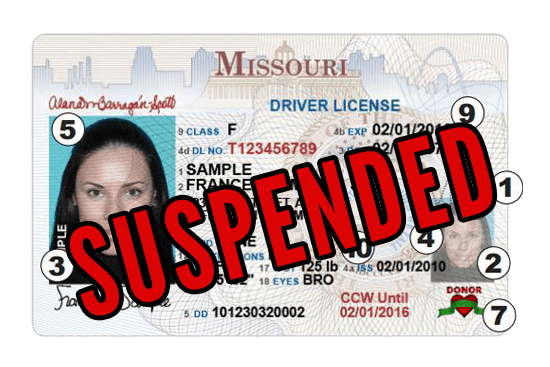 Suspended Driver’s License is the main reason of getting SR22 insurance in Missouri. Operators certificate – this certificate is issued to a driver that operates a vehicle that he don’t own. Owner certificate – this certificate is issued to a driver that operates a vehicle that he own. Operator-Owner certificate – this certificate is issued to a driver that operates a number of vehicles that he own and do not own. SR22 can be issued only by licensed companies. Select Insurance Group is licensed coast to coast to provide SR22 insurance solutions. As stated before – SR22 is not like regular insurance. It is not even an insurance. That is why not every insurance company can file SR22 for you. Also, not every insurance company will provide coverage to a high-risk driver with SR22 requirement. Our company works with even hard to insure drivers regardless their driver history. Please take few minutes to fill out our web form to get your Missouri SR22 quote. You are going to be very happy with our quotes. The main reason of getting SR22 insurance in Missouri is to reinstate driver’s license. It may be suspended due to various reasons like DUIs or other traffic law violations. In areas where public transport is not developed – car transportation is only way to have comfortable life. SR22 is a part of driver’s license reinstatement. It is impossible to legally drive without having SR22. This rule is valid if SR22 is required by DMV. Before actually getting SR22 you need to plan your budget. In Missouri SR22 is mandatory for minimum of two years. That means you can’t pause in paying for your policy and then continue later. Secondly, you need to shop around and find insurance company that you like. We’d like to offer Select Insurance Group services as we shop our products from almost everywhere. That means we can provide quotes from all over the market. Not only in Missouri, but all other states that have SR22 law. We also have professional team that will guide you through the process. To get started you need to fill out our short form. This form will give us overall picture of your situation. Once submitted, one of our licensed agents will be calling you back to verify some details. He will walk you through the process of getting SR22 and will inform you about your price on SR22 in MO. Once we receive your payment – we will e-file SR22 on your behalf to the DMV. It will take just about 5 minutes. Once this small process if finished – you’ll be able to print your ID cards instantly. The DMV will be officially informed about your filing so you can continue with driver’s license reinstatement. SR22 in Missouri is required for a minimum of two years. It is mandatory to keep it active for a full period of requirement. In case you fail to maintain you policy – SR26 form of cancellation will be issued. Missouri DMV will be instantly informed about your policy changes. Your driver’s license will be instantly suspended. Depending on your driving history mandatory period can be different. In worst case scenario, like multiple DUIs in a short time, can lead into 10 year suspension from driving. In case your SR22 policy lapse before required period your driver’s license will be suspended. You will need to start over by filing another SR22 form with a full period of requirement. The only way to avoid SR22 requirement is to obey traffic laws. $50,000 Per Accident. Maximum amount for all bodily injuries. Missouri is well known for its costs on SR22 insurance at the level of up to $25/month. Different companies offer full range of prices. Select Insurance Group is happy to offer $15/month and even lower. Generally speaking, prices are determined by your driving history. Find reliable insurance company that is licensed to provide SR22 products in Missouri. Great news, you already found Select Insurance Group for your liability needs. So as a step one, please consider getting Missouri SR22 quote from us. Request your insurance company to e-file SR22 on your behalf. Verify that your car insurance policy + SR22 certificate meet state minimum requirements. DMV will send you notification about receiving your filing. Make sure to maintain your policy for entire period of requirement with no stops. Once required period is over – you will no longer need to carry SR22. Your car insurance premiums will go down. Our company has license to provide SR22 insurance solutions in Missouri. We also have certified agents that are really professional in what they do. We would like to offer affordable SR22 in Missouri to our customers. Don’t hesitate to take advantage of our system and give us a call. Or you can fill out our quote form and we will call you back with your price. Promise, you are going to be very happy.